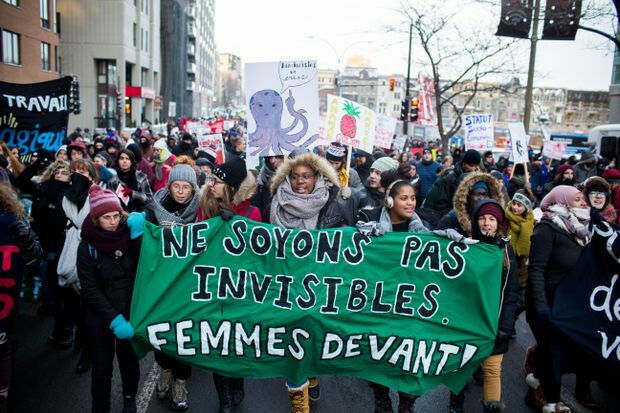 A throng of Quebec students demonstrated over unpaid internships in Montreal, Que. on Nov. 21, 2018. Charlène Boucher was supposed to be standing in front of a Grade 1 class this week as part of her university training to become a teacher. Instead, the education student was standing at the front of a boisterous street march, a protest banner in hand. Ms. Boucher is not opposed to her teaching internship. She just believes she should be paid for it. The 27-year-old student at the Université du Québec à Montréal has company. This week, 55,000 students across Quebec walked out of classes and boycotted their internships to press the view that even if placements might help their future careers, their labour should not be free. A throng of students demonstrated in Montreal on Wednesday to make their opinions heard. The protest fits into a movement across North America that is starting to look critically at unpaid internships, questioning whether the benefits of connections and job experience come at the price of exploitation. Field placements are often seen as a rite of passage as students leave the classroom for hands-on work. Unlike unpaid internships undertaken during the summer or after graduation, many of those arranged through colleges and universities are mandatory and count for course credit. The protesters say that because the internships are not considered work, students are not covered by provincial labour laws offering protections on wages, harassment or hours of work. And while internships in areas such as engineering and computer science are often paid, many in caregiving, education and social services are not – and they are disproportionately filled by women. “Even when it comes to studies, we haven’t reached equality between men and women,” said Ms. Boucher, who belongs to the Comités unitaires sur le travail étudiant (CUTE), which is behind this week’s walkouts. William Webb, executive director of the Canadian Intern Association, said the issue “is a problem across Canada.” Unpaid internships effectively favour students from better-off families who can afford to work for no wages, he said. Students pay university tuition. “You’re paying the educational institution for the privilege to work for free,” Mr. Webb said from Toronto. Students in the School of Social Work at McGill University have boycotted classes and internships this week. Undergrad Jacqueline Ohayon says she is required to put in 16 hours a week for her social-work field placement, in addition to her course load. To make ends meet, she has two part-time jobs. For her internship last year, Ms. Ohayon worked 400 hours over two semesters in a women’s shelter, organizing events, writing reports and doing assessments and home visits. She says several such community groups, already financially stretched, would be unable to function without students. “We’re there to take some of the load off them. And we’re completely necessary – without us, they won’t run,” said Ms. Ohayon, a member of the Social Work Student Association at McGill. Protesters want the province to finance their internships. The Quebec Education Minister, Jean-François Roberge, said he is looking at the question, and has asked the students to be patient. Mr. Roberge said he began a review of the issue when he took on the portfolio last month in the new Coalition Avenir Québec government. Nico Trocmé, director of McGill’s School of Social Work, said it is important to recognize the 180 internships in his department as “educational and not a work placement.” And he says the university is thankful organizations are willing to take on students who are gaining practical experience. But he said funding for field placements would help attract students from diverse backgrounds who might not otherwise be able to afford to do an unpaid internship. The student group behind the protest says it will call for a general strike in January if its demands are not met.